Carlos Lagos P. and Jorge Budrovich S. discuss the massive student movement in Chile and the social unrest which has accompanied it. which otherwise had not been used in Chile since 1985, when it was often a form of opposition to military rule. has become more flexible, since the quality of education that a young person receives and their labor market prospects depend on how much his/her family has paid previously. The industry of technical-professional education, in the best of cases, assures that members of the lower middle strata remain there, which, in any case, seems better than nothing. This helps us answer the question why, today, the student movement is being much more intransigent in its demands than was the “penguin revolution”5 of 2006, or the periodic student “flues” of recent years. The fact is that, in the past several decades, the destruction of the social “tissue” gives the parties of the left and the right the monopoly over formal organizations, as well as over the very initiative and capacity for action of students and workers, in the student centers, federations and unions. The “laissez-faire” strategy toward the social movement, however useful it may be for the left and center left parties, also implies a potential loss of control which is difficult to ignore. This potential self-activity is obvious in the proliferation of autonomous means of communication, the assemblies and the independent networks emerging in recent months, through which a distant and cautious attitude toward parties and formal organizations became clear. This attitude was given form in a slogan cropping up repeatedly in the street demonstrations: “The people united moves forward without a party.”6 The spread of the conflict throughout the country also shows in some way this relative autonomy of the social movement from the parties, since the formal organizations have always tended to concentrate their forces in the capital, thus following the modus operandi of bourgeois politics, which centralizes and concentrates things in order to better control them. 1. This card is used for discounts on various types of purchases. 2. The Confederacion Unitaria de Trabajo, the national trade-union confederation. 3. This method of protest characterized such uprisings as the “piquetero” revolt in Argentina in 2001–02. 4. A plan for measuring social-economic status. 5. A shorter-lived student mobilization in 2006, which began to raise some of the demands. 6. “El pueblo unido avanza sin partido.” A significant “correction” of the putrefied Popular Front slogan “el pueblo unido jamas sera vencido,” which mass demonstrations were chanting in Santiago just days before the September 1973 overthrow of Allende, and which has been mindlessly taken over by the international left with no apparent understanding of its sinister overtones. End the repression! 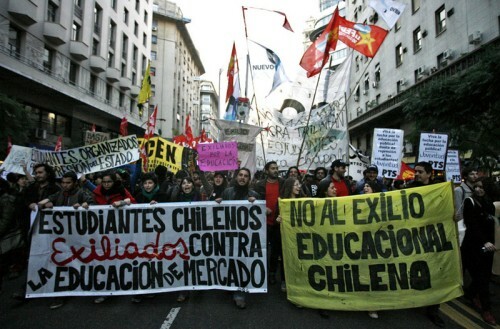 IWW union supports Chile's students fight for education! The meaning given to all these events varies a great deal, of course, depending on the position one occupies in the order of exploitation; but for everyone it has some meaning: the revolt has forced people to think about how, why and for what they are living. When might we see part 2? Subjugation by credit, advertising, and ... medication? What? Don‘t get all conspiracy-theorist. don't worry about it eriffo, this article ain't that great anyway.